Bunk Beds!! Whether you are looking for extra sleeping room or the coolest present your kid could ever get, we offer a full collection of log bunk beds at LodgeCraft. Bunks work well in a ski lodge or mountain/hunting cabin for adult guests. 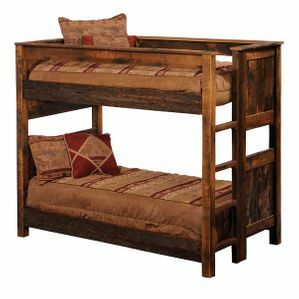 Choose from our pine, cedar, aspen, barnwood, and traditional old hickory log bunk beds. In a variety of mattress and finish options, these log cabin style bunk beds are the perfect addition to any room. We also have a range of sizes, including the popular twin over twin bunk bed and extra-long twin for teens and adults. Best of all, we can make your bunk bed with the options you need in just about any size. Made in the USA, all of our log cabin style bunk beds are made with the highest quality materials to ensure sturdiness and long-lasting durability. Best of all, we offer free shipping in the lower 48 states. We also offer some trundle beds, so you can pull out that extra bed when it is needed.